That we’ve never much cooked with seafood on the blog (save for fish and shrimp) or made much broth (except that awesome oxtail broth for the pho), this meal provided a new challenge that I knew would have a big payoff at the end. Start with the veggies. 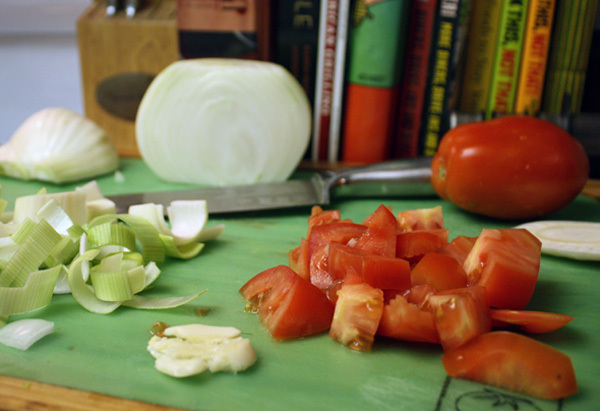 Roughly chop 1 leek, 1 yellow onion and 1 bulb of fennel (medium dice). Smash 1 clove of garlic and roughly chop 2 roma tomatoes. Seed and small dice 2 more. Reserve the diced tomatoes in the fridge. In a large sauce pot, heat 1 T of olive oil over medium-high heat. 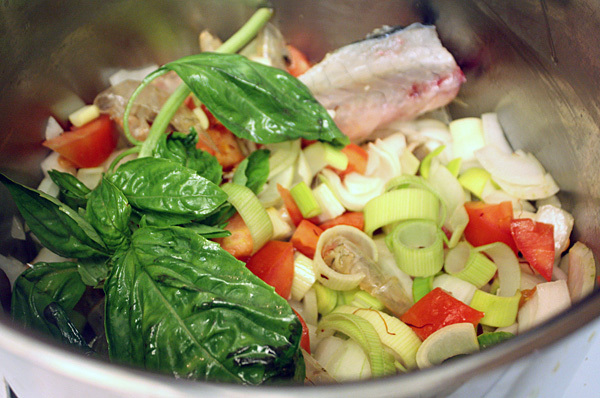 Add leek, onion, garlic, 1/2 of chopped fennel, chopped tomatoes, 1 large pinch of saffron, fish bones and shrimp shells. Cook, stirring occasionally, for 5-7 minutes until the veggies soften and the mixture yields and intoxicating aroma that they should bottle and make air fresheners out of. 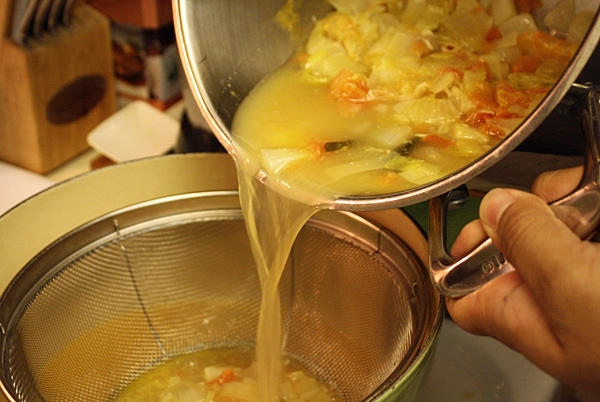 Once the mixture starts sticking to the bottom of the pot a bit, deglaze the pot with 1/2 cup of white wine. Add 6 cups of water and bring to a boil. Reduce to low and let simmer for 45 minutes. 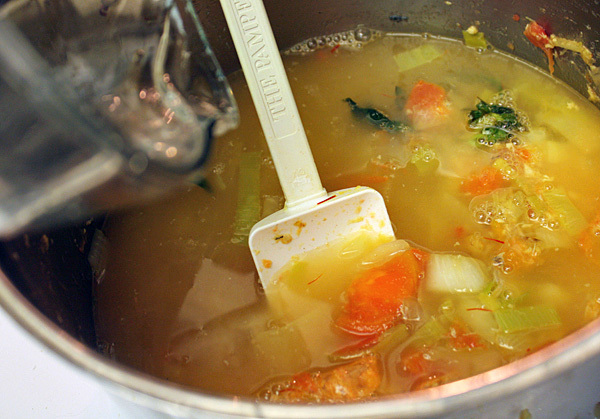 While the broth is cooking, you can knock out the rest of the recipe. In a blender or Magic Bullet, add 5 oz. 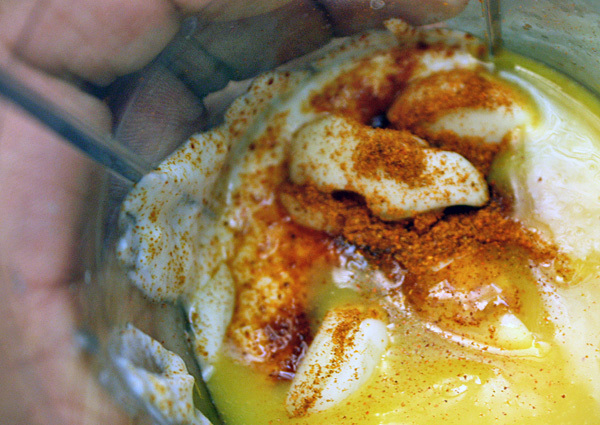 of Greek yogurt, 4 cloves of garlic (roughly chopped), 2 T of orange juice concentrate and 1/4 t of cayenne pepper. In a bowl, combine the other 5 oz. of Greek yogurt with 2 T of chopped basil. 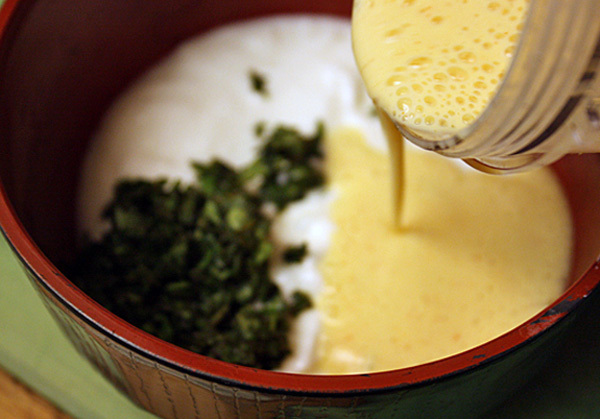 Lightly whisk the blended yogurt with the yogurt and basil, and season with salt and pepper. Reserve in the fridge. 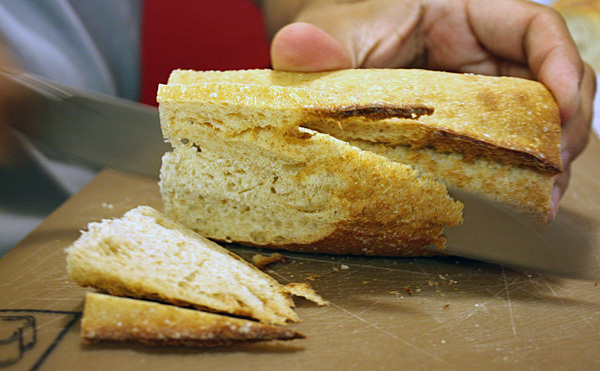 Slice a 5-to-6-inch piece from the baguette and cut four slices from it, about 1/4-inch thick, on a severe bias. Plan according to time, but you want to preheat the oven to 375 so you can cook your croutons about 5 minutes before you finish the soup. When you are ready to make the croutons, brush them lightly with olive oil and season with salt and pepper. Bake croutons until lightly golden brown. Once the broth is done simmering, strain into another pot. Season with salt and pepper to taste. 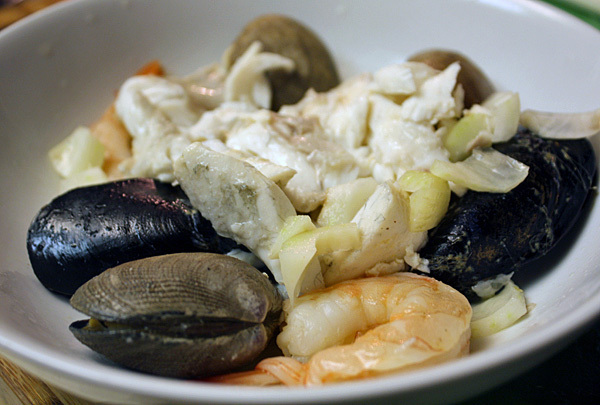 Add remaining fennel, clams, mussels, shrimp and fish filet pieces. 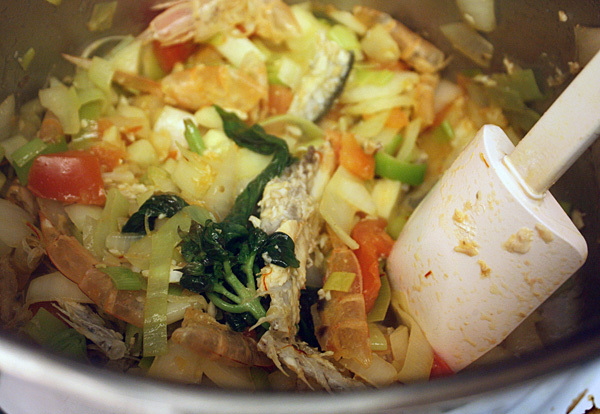 Cover the pot and cook for 3-5 minutes, untilfish and shrimp are cooked through and the mussels and clams are opened. Discard any shellfish that didn’t open on its own. 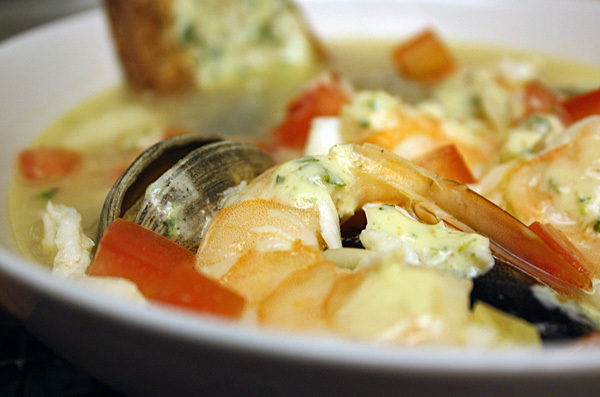 To plate: In each bowl put 3 shrimp, 3 clams, 2 mussels, and 2-3 pieces of fish. Ladle in broth. 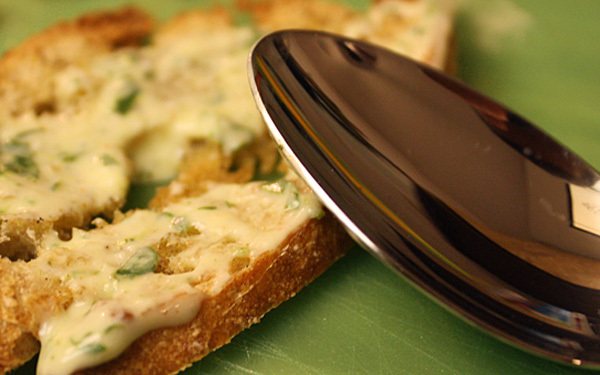 Garnish with chopped tomato and a drizzle of rouille. 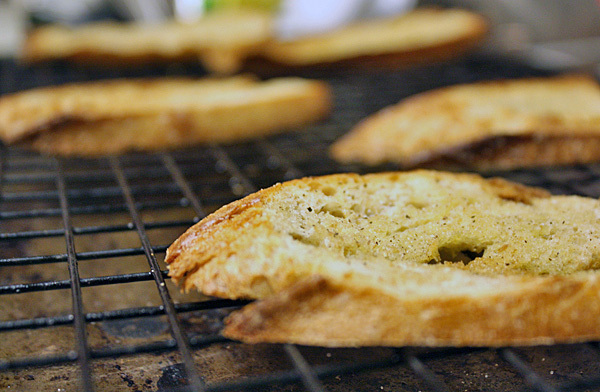 Spread a thin layer of rouille on the crouton as well, drop it in the soup and dig in! Chef Brian said I’d get that restaurant feeling from this one and he was right. Though my seafood was a bit rubbery because I overcooked it (be careful on that). 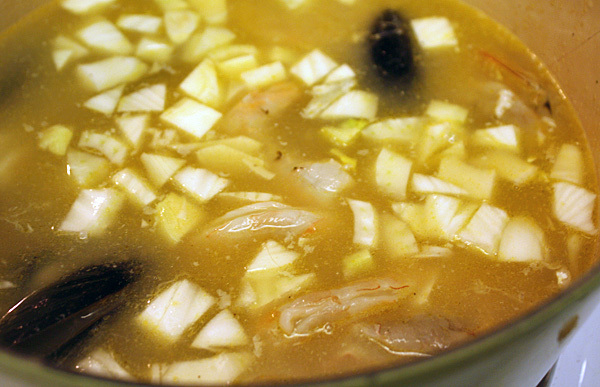 The crunch from the fennel contrasted nicely with the plump shrimp and tender fish, so the soup wasn’t just pretty, it had texture too. Best part was the crouton. The bread sucked up the broth so each bite had a concentrated burst of salty, briny ocean followed by bright, citrus-spice punch. I can’t believe this was dinner. At home.